"At Home in Hyderabad": First India Road Trip Part 3 - "Warangal Fort and the Shiva Temple"
First India Road Trip Part 3 - "Warangal Fort and the Shiva Temple"
Sorry! I almost forgot!! (Just one more reason to write in my blog within 1-2 days of a trip...at my advanced age, let's face it...you forget stuff!!) Before we went back to the hotel, and before we saw the "1,000 Pillar Temple"...Krishna and I drove out to the local Maa Kali Temple, right on the waterfront of a huge (it turns out that it's man-made, but still very beautiful!) lake right inside Warangal. More properly, the temple is called The Bhadrakali Temple at Hanamkonda. The Bhadrakali Temple is an eight-century-old temple, built by the Kakatiya dynasty, and it is perfectly placed on a holy mount nearby Warangal city. 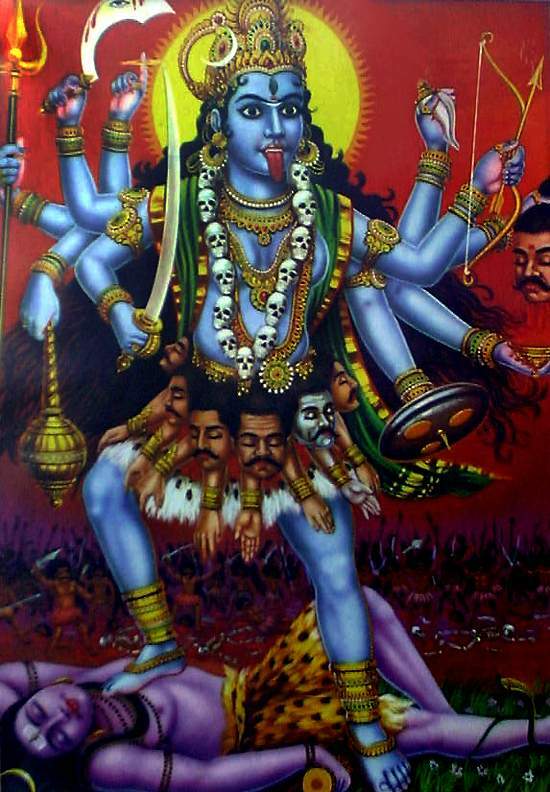 The temple enshrines the Goddess Kali, (see photo, above-right) the mother Goddess in Hindu mythology, adorned with weapons in all the eight arms and the statue of the Goddess is in the sitting posture with a crown in her head. The structure of the temple is in the amazing architectural style of Chalukya’s. This was an amazing temple...they were setting-up inside for evening pooja (prayer) and darshan. Darshan, or, sometimes spelled Darśana (Sanskrit: दर्शन) is from a Sanskrit term meaning "sight" (in the sense of an instance of seeing or beholding; from a root Sanskrit word meaning "to see" - a vision, an apparition, or simply a glimpse. It is most commonly used for "visions of the divine," e.g., of a god or a very holy person or artifact. One could "receive darshana" of the deity in the temple, or from a great saintly person, such as a great guru. I have come to understand that darshan is hugely popular and a major part of Hindu worship. In the sense "to see with reverence and devotion," the term translates to hierophany, and could refer either to a vision of the divine or to being in the presence of a highly revered person. In this sense it may assume a meaning closer to audience. "By doing darshan properly a devotee develops affection for God, and God develops affection for that devotee." Vivek's friend Bhaskar - and Bhaskar's friend, Prabhakar, got into the car with us....but they were a wee-bit apprehensive about sitting in the back seat with Beloved. As you can see from the photos on my Facebook Page Photo Album - by the time of our departure from Warangal on Wednesday afternoon, the three of them were fast friends...Prabhakar even requested that I take a photo of him and The Bee (see the last few pictures!) It was pretty sweet - - but for the rest of our First Day - - I held The Bee on my lap in the front passenger seat, which can be a bit of a pain in the you-know-what - she's a little wiggle-worm ESPECIALLY when she sees animals out the window. And on this leg of the journey we saw them all!! Water buffalo, cows, about 10,000-odd goats - - and our first monkeys!! I couldn't understand any of the Telugu that my three friends were speaking...but I THOUGHT we were heading to the Warangal Fort - - another local touristy-place (a place that Vivek had warned me "wasn't really all that much to look at..."). However, with the lads in the back-seat calling out directions in what I have come to call "Teluenglish" - - we ended up parked in front of this farmhouse in town. As it turns out, this was Vivek's boyhood home and the home of his father and brother. For some unknown reason, Bhaskar thought it was important that I see where Vivek grew up. I was to find out later that Vivek had asked Bhaskar to "please NOT bore (me) with a trip to the farmhouse..." But here we were anyway. Now - - I have learned much about Indian hospitality...it is legendary. There is no pulling up, seeing the house and saying, "Oh, that's nice...now let's go...!" There was to to be the taking off of shoes, the sitting inside in the living-room, some idle chit-chat (kinda tough when there is only one of us that speaks any real, understandable English!) seeing pictures of the family, a tour of the house, sweet coffee, (tea for Krishna)...the highlight was having Bhaskar hold up a photo of an approximately seven-year-old Vivek, along with his older sister and brother...the "photo of the photo" that I took is also in the Facebook Album. Vivek was mortified...but I think he was a cute kid!! After we were done and I thanked the housekeeper for the great coffee...we were out on the road again. As it turned out, the fort really WAS worth seeing. The Warangal Fort is situated 12 kilometers from Hanamkonda in Warangal city in Andhra Pradesh. 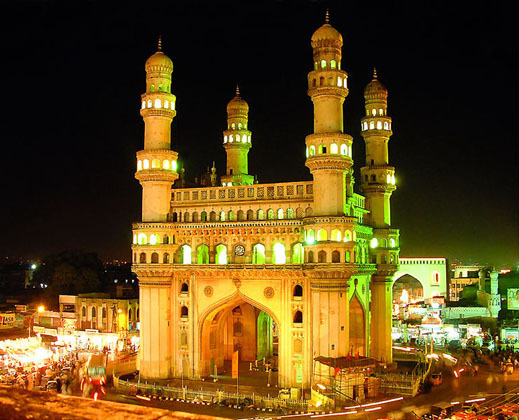 It was constructed in the 13th century by the Kakatiya dynasty. The City of Warangal is to the northeast of Hyderabad, almost exactly 150 kilometers from it. The two cities are linked by road and rail. The train might be fun sometime...because, due to this year's heavier than usual monsoons...the roads are hammered!! Warangal Fort is in southern Warangal - and a bit of a drive from Vivek's farmhouse. Warangal Fort, although now in ruins, was once an impregnable fort in the state. Close to the Ekashila hill rock, there are different layers spreading out. The building of Warangal Fort began in 1199 AD at the instructions of the Kakatiyan king Ganapati Deva and his daughter, Rani Rudrama Devi supervised the process till its completion in 1261 AD. The remnants of the fort that are present in the city provide some useful insights of the past civilization that used to occupy these lands. Warangal Fort is reputed for its architectural magnificence besides its history. The remnants of the fort comprise imposing gateways and tall, elegant towers, each almost 50 feet tall. The special feature distinguishing the four enormous pillars of the gateway is that they have been cut from a single rock. Three protective layers ensure the protection of what was once the inner precincts and center of power. Part of the ruins consist of delicate sculpture and stone work, motifs and designs delineating animals like lions and swans. Inside the fort area are the residues of temples razed to the ground by the early Qutub Shahi kings. The place is full of riches and resources from the past. Although I wanted to "call it a day" (NO CHANCE WITH THERE TWO GUYS AS THE TOUR GUIDES...WE WERE JUST GETTING WARMED-UP!!!) - they made Krishna stop the car so that I could go into to the "Kush Mahal" - a beautiful structure with Muslim overtones...but was actually built in 1504 A.D. by a man named Shitab Khan - - who - believe it or not, with that name, is attributed with Hindu origins. After a killer-climb up some steep stone stairs, I could see why the boys insisted that we stop. The view from the top of the Kush Mahal was tremendous....you could wee the whole area from up there!! That's it, right?? We're done!! The sun is almost down...we've been on the road since 7:00 this morning....let's go back to the hotel!! No way, Jose!! This night was FAR from over!!!! (To "Bee" Continued in the 4th and Final installment! Nice post!! Really loved reading this blog. Its a good place to visit. Thanks for this post. Make your trip in Meghana Travels to enjoy your trip. Nice post.The way you explained about your trip and travel is really good. Warangal Fort has a place with the thirteenth century when it was built by King Ganapati Deva. Bestbus.in is one of The Leading Online Bus Tickets Booking Website India. You can Book Bus Tickets Online at Low & Cheap Prices. Bus Reservation, Book Bus Tickets, Online Bus Tickets.In The resort property houses everything from cricket fields, golf course and naturopathy spa to ponds filled with ducks and lovely sculptures and fountains every few metres.Welcome to Bestbus the Best Online Bus Tickets Resorts home Booking Portal in India etc..
Hello, Your blog is very helpful..
Real Trainings provide all IT-Training and Non-IT Training Institutes information in Hyderabad, Bangalore, Chennai . Corporate Companies information and Real time Trainers information at one place. Here students can Compare all Institute's Courses with all detailed information.In real trainings provides IIT Coaching Institutes in Hyderabad ,IIT Online Training institutes,IIT cocaching centers,IIT Training,best IIT Training institutes ,IIT Online courses,IIT online training classes etc. SAP Training Institute in Hyderabad and Banaglore, SuccessIT provides SAP Online Training, Class room training, SAP MM online training, SAP SRM training, SAP WM training, SAP S/4, SAP EWM, BI, BO, FICO, PM, PS,more at LowFee.Training at Success IT is incomparable with any other and they will train you in such a way you will have clear balancing between the theoretical knowledge and real world environment.In Success IT is Best SAP WM Online Training Institute in Hyderabad, Bangalore, we provide Online and Class Room Training for SAP WM Module at Low Fee. SAP WM Coaching etc..